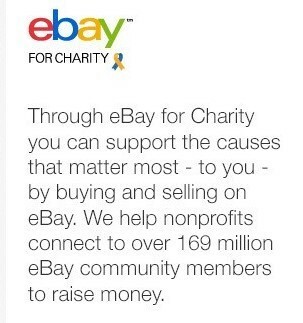 eBay for Charity gives sellers, buyers and charities an opportunity to connect and do good. Consumers can support their favorite organizations while buying and selling, and nonprofits can connect directly to consumers to raise funds for their organizations. Sellers can donate a portion of their proceeds to their favorite charity, while buyers can purchase items sold directly by top nonprofit agencies who use the proceeds to support their work. Check out our For Sellers, For Nonprofits, About US and My Causes pages to learn more about how you can work with eBay to support a good cause. Let's do some good together.